Filmmaker David Edmond Moore’s masterpiece is the achievement of more than three years of research and creativity. In just 59 minutes, History’s Hidden Engine shows that social mood drives trends in movies, music, fashion, finance, economics, politics, the media and war. Moore’s incorporation of pop songs, news footage and familiar cultural images makes the film as lively and engaging as it is educational. Now you can own History’s Hidden Engine and stream it any time you like. Every chart is in crystal clarity; every segment viewable full-screen on your computer or device. Plus, you’ll also receive a second streaming video containing almost 90 minutes of extended interviews with many of the scientists and financial professionals who are involved in this revolutionary field. Many of us at the Institute feel the content of Volume Two, Broader Discussions in Socionomics, is even more intriguing for the viewer who wants to learn more about this topic. This video includes the documentary as well as an interview with director David Edmond Moore. This video includes interviews with several of the experts involved in developing socionomics, an introduction to three institutions actively advancing the science, and bonus footage from the documentary. 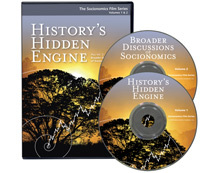 History's Hidden Engine is available as part of a 2-volume streaming video set. Volume One is the documentary; Volume Two includes bonus footage as well as extended interviews with many experts in the field of socionomics. "Just watched History's Hidden Engine. What a fantastic contribution to the world. Well Done!" "I will be ordering your new DVD set for my library. I am rather anxious to share it with those closest to me." "If History's Hidden Engine doesn't turn so-called 'conventional wisdom' on its head... I don't know what will."